Stylish restaurant serving up classic American dishes. 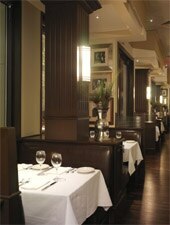 : An outpost of the original Grill in Beverly Hills, the Dallas location has a touch of that same swanky glamour. The granite bar, tiled floor and framed photographs create an elegant yet relaxed atmosphere where lunching Highland Park denizens might nosh on an ahi wrap before heading into the Galleria Mall for some serious shopping. The lengthy menu covers classic American comfort food, from shrimp cocktail and Cobb salad to chicken potpie and meatloaf. Meats are aged for flavor and hand-cut daily. You can relish your filet with potatoes made a variety of ways, from shoestring to garlic mashed. The wine list is lengthy and interesting, and the bar is lined with a staggering selection of top-shelf liquors that your attentive and well-trained server will gladly fetch for you. Desserts include the signature fudge brownie pie or strawberry shortcake.